buy 1 get 1 50% off men’s Merona apparel; 25% off All Xhilaration and Merona tights; 25% off Devine Color Paint; $29.99 Holmes 16-in.-dia.stand fan; 30% off Select Threshold furniture; 20% off select Wall decor, mirror and frames; $69.99 Surefit 2-pc. sofa slipcover; 15% off All Area Rugs; $19 Twin-siza licensed comforter; 10% off All circo bath decor; 25% off All Eclipse light-blocking window panels; $139.99 Keurig 2.0 K300; $189 Shark Rotator slim-Light Lift-Away vacuum; $79.99 TracFone Samsung Centura; $59.99 Polaroid 300 instant camera; $179.99 Bose SoundTrue headphones; $34.99 Disney Infinity 2.0 Edition Marvel Super Heroes playset; $679.99 Vizio 55-in. 1080p resolution 120Hz refresh rate Smart LED HDTV; $14 Classic games; $24 Lego Sets; $16.99 Neighbors Blu-ray+DVD+digital; $19.99 Killing Patton: The strange death of world War II’s Most audacious General by Bill O’Reilly book; $4.49 up and up Lotion; $11.49 Schick Xtreme3 8-ct.razors; 10% off select softsoap items; 10% off select Jergens hand and body lotion; $6.99 up and up Ultra soft bath tissue; 10% off select Planters peanuts. 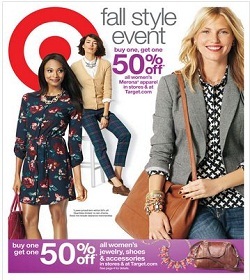 Target stores activate their latest weekly ad every Sunday.